Boasting the Area's Largest and Newest Paddling and Pedaling Fleet! Come, enjoy our piece of heaven on the Forgotten Coast of Florida's Panhandle. Happy Ours invites you over for a fun-filled experience. Whether you're a beginner on stand-up paddle boards, a seasoned kayaker, a family with children, avid angler, bicycling enthusiast, or church group seeking an eco-spiritual outing, let us help you plan your next nature-based adventure. Paddling, pedaling, and snorkeling equipment is available for rent and may be launched from our site, picked up or delivered. Discounts are available for extended rentals, and reservations are available but not required. Walk-ins are welcome. See "rentals" on the navigation bar for more information. 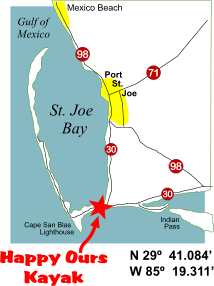 Those who prefer a guided tour may choose from kayaking eco-tours, kayak-snorkeling trips, and guided scallop fishing on St. Joseph Bay. See "Guided Tours" on the navigation bar for details. We have a large fleet of kayaks, paddleboards, and canoes, singles and tandems, sit-on-tops and sit-ins, of all shapes and sizes to meet your individual needs and preferences. Plus a variety of accessories are available for rent in case you forget something. Best of all, you can get right into the crystal clear water at the head of the Bay without the inconvenience of hauling or lugging your craft to the nearest shore. We offer free orientation and safety tips for newcomers so you won't feel like you've been "left up the creek without a paddle." Visit our Rates page for details. And those who prefer a guided trip are in for a real treat! We offer eco-tours, guided snorkeling, and scallop fishing trips that have earned us a five-star rating by customers and travel editors. During the summer scallop season, our guides will teach you where and how to harvest this delicacy. You will also find that kayaks are the best way to reach the lush grassbeds without harming our fragile eco-system. St. Joe Bay is famous for its rich beds of this tasty bi-valve. But the scallop population has continued to decline in recent years, and restoration measures are underway by FWC to replenish the fishery. For details about the dates of this year's scallop season, visit the Scalloping section of our Guided Trips page. Our bicycle fleet was added in 2012 and we're still growing. We have one-speed coaster bikes size 20" for youth up to 26" for adults. Because you asked, we added trailers for toddlers, and a 16" bike with training wheels. All of our bikes come with helmets, baskets, locks, and whistles. Visit our Rental Fleet page and our Rates page for more details.